Live attenuated recombinant measles vaccine virus (MV) Edmonston-Zagreb (EZ) strain was evaluated as a viral vector to express the ectodomains of fusion protein of respiratory syncytial virus (RSV F) or glycoprotein 350 of Epstein-Barr virus (EBV gp350) as candidate vaccines for prophylaxis of RSV and EBV. The glycoprotein gene was inserted at the 1st or the 3rd position of the measles virus genome and the recombinant viruses were generated. Insertion of the foreign gene at the 3rd position had a minimal impact on viral replication in vitro. RSV F or EBV gp350 protein was secreted from infected cells. 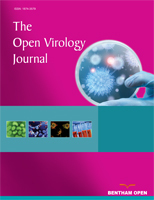 In cotton rats, EZ-RSV F and EZ-EBV gp350 induced MV- and insert-specific antibody responses. In addition, both vaccines also induced insert specific interferon gamma (IFN-γ) secreting T cell response. EZ-RSV F protected cotton rats from pulmonary replication of RSV A2 challenge infection. In rhesus macaques, although both EZ-RSV F and EZ-EBV gp350 induced MV specific neutralizing antibody responses, only RSV F specific antibody response was detected. Thus, the immunogenicity of the foreign antigens delivered by measles vaccine virus is dependent on the nature of the insert and the animal models used for vaccine evaluation. Keywords: Measles vaccine, Edmonston-Zagreb, RSV F, EBV gp350, Cotton rats, Rhesus monkeys..
© Mok et al. ; Licensee Bentham Open. * Address correspondence to this author at the MedImmune, 319 North Bernardo Ave, Mountain View, CA 94043, USA; Tel: 650 603 2367; Fax: 650 603 3367; E-mail: jinh@medimmune.com§ Both authors contributed to the work equally.